I hate bullies. It’s all I can do not to walk up to the little 5-year old punk that doesn’t let Little Brother up the ladder to the slide and shove him off the jungle gym. I can barely contain myself when some mental midget thinks he’s “all that” and decides to taunt the little girl with glasses. I want to give ’em a firm talking to and a time-out that lasts until he’s twelve. But, I say that (and I mean that) knowing that I may have not always been the kindest of children. Like everyone, I fell victim to the desire to be “cool” and sometimes being cool meant not treating everyone the same, fair way. My freshman year at boarding school (a mecca of hormones and popularity struggles), there was a senior girl who was clearly not cool. She was a straight-A student. She was pale. She has two first names (like Janie Sue or Betty Ann, you know?) and she was neat as a pin. She was also never anything but nice. But, my friend and I were dying to be cool. And, consequently, one day we were not very nice to our two-named dorm prefect. Not surprisingly, she did a lot of laundry. Neatly folded, ironed, pressed and perfect, her clothes weren’t brand name but they were nothing if not taken care of. She was in the laundry room of our dorm all the time, it seemed. Washing, folding and probably enjoying the order of things. Until she lost a white sock. Seriously? I mean, come on. How many socks get lost in the laundry every year? Especially in a prep school dormitory where we all tossed our things and, often, forgot about them in the dryer for days on end. We couldn’t resist. My friend and I went to our room and made our own sign. We posted it under the cover of darkness next to her note. WHO LOSE SOCKS EVERY. SINGLE. DAY. We thought we were hilarious. When we got back to our dorm the next morning after classes, our note was still there. Hers was gone. I feel terribly about it. Still. Today. What a bitchy thing to do. Twenty-four years later, I still feel like a schmuck about that note. And she’s not reading (of course) but I wish she knew I hate that I wrote that stupid note. And that I’m not that kind of a person. So, maybe that’s why, when I see Little Jenny tease Little Julie on the playground, I want to step in and shake her. I want to tell her to cut it out. That, sure, she may feel pretty cool acting that way now (as her friends giggle at Julie’s expense). But, it’s just not right. And, when she’s a thirty-nine year old parent, she’ll be praying to god no one treats her child the way she once treated someone else. 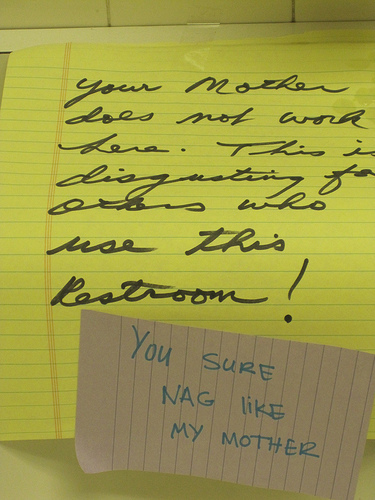 Along the same lines, I’ve discovered a hilarious blog called Passive Aggressive Notes that cracks me up almost daily. People can be so ridiculous. Here’s one of yesterday’s gems. Oh the regrets from being the bully! I too suffered from the desire to be cool. I think back to things we use to do at sleep overs and I am just appauled. I am terrified at what my two little girls will go through. Can’t we all just be nice as little kids?! 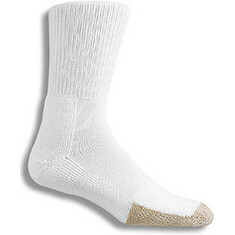 Maybe I am that white sock girl because I seem to lose at least 2 a week. Are you taking them?????? I am being paid back for any and all things bully I did as a kid. The Little Ballerina is going to make me an outcast on the play date scene b/c SHE is a bully! I have to go check out that blog. That post-it looks suspiciously like BSD’s handwriting!